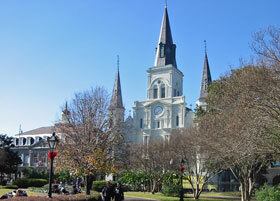 It’s great when several things go right all at once, and the cheap airfares to New Orleans coming at this time of year are perfect. The more expensive flights that we were seeing all summer were never very tempting because that city is actually quite miserable during the hottest months of the year. The humidity can be out of control and it rains fairly often as well, so spring and fall are the best times to go anyway. Right now you can fly from San Francisco to New Orleans for $240 round-trip. From Los Angeles it’s $290, weirdly enough, but it’s only $240 from Las Vegas and only $250 from Tucson, Arizona. From Baltimore it’s only $210 round-trip, while from New York it’s $230. There are great fares available from almost all major cities at this point. In some cases you might be better off flying from the second closest airport to you because this sale is a bit uneven, but the point is that for under $300 round trip you should be able to pull it off from almost anywhere in the US. Even though spring and fall are the high seasons for hotels in New Orleans, they are still much cheaper than hotels in most any other major tourist city. During high season you can get something for under $100 that is quite nice, and if you don’t mind staying a bit out of the center of town you can find something closer to $60. Another thing that makes New Orleans different from most other tourist towns in the US is that food and drinks are quite cheap there, or at least they are available at low prices if you look around a bit. The thing is that it’s still a somewhat poor city and the local people can’t afford to spend $15 on a simple lunch like they can in Washington DC. For this reason you’ll find many of the most popular restaurants for locals will have meals for around $6 or so. The food is excellent and it’s worth trying a few of the better restaurants while you are there, but honestly the local favorites like the po’ boy sandwiches are amazing and very filling. Look for a place with a long line at the counter and you’ll be getting one of the best sandwiches of your life. It’s also important to skip restaurants in hotels because they can charge double or triple for similar items and still do well because many people are either too lazy to look elsewhere or they are on expense accounts where charging a meal to the room makes things easier. Rent a car if you must, but you can actually get around New Orleans on foot and by public transportation, and you won’t have to worry about parking. Even the nightlife tends to be cheap because there are so many bars competing with each other along Bourbon Street and its surroundings that they have to advertise cheap happy hour specials that go way into the night just to stay busy. That might not be true during New Years and Carnival weeks, but otherwise this is a very cheap city to drink in.